The Ebola outbreak is putting food harvests in West Africa "at serious risk", the UN's Food and Agriculture Organization (FAO) warns. It has raised a special alert for Liberia, Sierra Leone and Guinea, the three countries worst affected. Rice and maize production will be particularly affected during the coming harvest season, says the FAO. 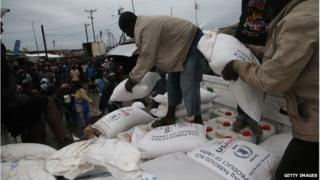 The food shortages are expected to worsen in the coming months. The outbreak has killed at least 1,550 of the 3,000 people in four countries since March - the worst Ebola outbreak in history. After a Guinean student with Ebola escaped from a clinic in his homeland and took Ebola to Dakar, Senegal's president said if the student were not sick "he would be before the courts"
For months now, quarantine zones and restrictions on movement imposed to help contain the Ebola disease have severely hampered the transport and sale of food, the Rome-based FAO says. Consequently food prices have shot up, as panic buying and shortages have set in, and getting access to food has become a pressing concern for many people in all three worst-hit countries in West Africa. The price of cassava, for example, rose 150% in the first weeks of August in the Liberian capital, Monrovia. "Even prior to the Ebola outbreak, households in some of the affected areas were spending up to 80% of their incomes on food," said Vincent Martin, head of the FAO's Dakar-based Resilience Hub, which is co-ordinating the agency's emergency response. "These latest price spikes are effectively putting food completely out of their reach," he added. To meet short-term food needs, the FAO has jointly approved an emergency programme with the UN's World Food Programme to deliver 65,000 tonnes of food to the estimated 1.3 million people affected by Ebola over three months.